In this final installment of the Blind Dead series, a doctor and his wife move to a small inhospitable coastal village where he plans to start a practice only to discover that undead demon-worshiping Templar Knights haunt the place. The living corpses of the Satan-worshiping Knights Templar hunt for human victims in a 16th century galleon. A young woman discovers that the pesticide being sprayed on vineyards is turning people into killer zombies. Q: Is there an uncut version available in the States? A doctor and his wife open his practice in a traditional coastal town, where they are met with distrust and hatred from the locals. The couple soon find out that town harbours an ancient evil - offering resident women for sacrifice to the zombie dead Knights Templar then to be eaten by crabs. 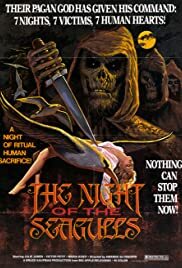 Although only connected by the Knights returning to life Night of the Seagulls (La Noche de las gaviotas) is the fourth and final zombie Templar film from Director /Writer Amando De Ossorio. Although it takes about 20 minutes for the Knights to rise from their graves in the seaside town, Night of the Seagulls is the faster paced of the bunch. This borrows from H. P Lovecraft, clearly Dagon has influenced this instalment. There's more fog, more eerie music and the dreamlike visuals come thick and fast, odd townsfolk, zombie knights on horseback and screaming seagulls. There are fewer leads, the couple and the village girl are adequate enough and there are plenty of worn and old faces on display, Amando De Ossorio throws in the obligatory slow 'village idiot' that is hounded by the community. Debatably I maybe being to critical here but as a standalone film it works better if you haven't seen the other Blind Dead films, but for those familiar with them it's old trodden ground, a remake of a remake, that's it hard to enjoy fully without fresh eyes. The dubbing and seventies jumpers aside this last Blind Dead retains it's creepy atmospheric factor and trades the better sets for some character development. Technically it's put together well but the closing act with a siege on the a house has been done and despite some good makeup effects is somewhat anti-climatic. That said, it redeems itself with the church showdown and conclusion. All in all a mix bag of enjoyable bones.